It’s time for the weekly update on PSP Digital Comics. 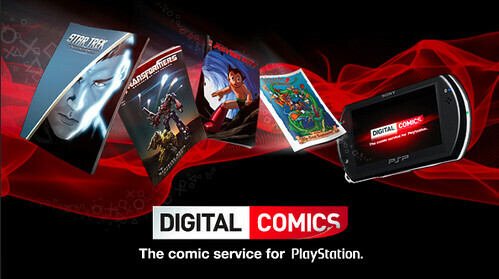 As always, you can visit www.playstationcomics.com for more information. Below is the list of comics that will be available today. Can you look into adding Friendly Neighborhood Spider-man #42 to complete the One More Day storyline? Parts 1, 3, & 4 are available, but not this one. I’m hoping for the bundle / graphic novel deal where you still pay a lump sum but you get more than one at a time. Manga would also be nice! And man, I hope DC gets on board soon. Marvel is so-so with most of their storylines, but I prefer most of the DC universe. Steam sales make me go broke. Lets do it here too:D Even if its just one game a week. I’m very happy with the comic store. X-men are my all time favorite and I look forward to more each week. No manga = no purchases from me. Really gotta get some other publishers on board. You got a ton of anime on the video store, why not do the same with manga for the comic store? This is a unique and great service! How about some Mirage TMNT? This is kinda off topic but I found funny how the comic book store update is more on time every week in the morning and the PSN store has random and frustrating update times. Whoever is making the comic store updates the night before Thursday should work on the DLC store, to see if the updates are more early and on time. @12 LOL This is about it major update for the PSPgo we will see. 1 PSP game and maybe 1 Ps1 game on the update tonight for PSPgo. Pspgo has turned into a joke. And your PS3 idea there working on it like voice chat. (theyll get to it when they get to it. go figuare). Wheres paranormal activity #2 and BONGO comics. if you guys can tell us whats going to be updated on the comic store, why cant you tell us what GAMES we are getting. the lack of information on PSN is horrible. and where is vagrant story ????? hey im wondering the same as jetup,where’s wormwood #8??? I’m using this thing a LOT more than I thought I would. Cheaper Transformer comics and the motion and easy music player makes it a more entertaining experience. I agree with the TMNT comics. Any chance we’ll get DC? When will we see some new video footage of GOW 3 please ? I can’t wait anymore, i am going crazy if i don’t see some new gameplay videos. Please show CANADA some love SONY! On the outside looking in on this one. Please DON’T bring the comic store to PS3! As a Canadian I already have enough icons on my XMB that don’t do anything. Great update! I’m going to buy some X-Men, Orgin and Hulk, and I’ll probably get Ultraheroes: Prologue, since it looks like its free. I hope we get Savage Dragon and Spawn in future updates. I was really excited when I first saw this service as I have a Marvel digital account and figured this meant I could read my marvel digital comics on my PSP. Obviously this isn’t the case though! Is there ever going to be some form of integration between Marvel digital and “Playstation Comics”? Any plans to bring manga to the comic store? Would love to have Naruto Shippuden on my PSP. I don’t own psp lol Question Digital Comics are they even worth money later on after you buy them? Like real thing? Hey since the motion controller uses both the Eyetoy and a controller, how about calling it the Eyeball? I guess the issue had adult content or something…. To anyone who hasn’t read ORIGIN, make sure you pick that up. One of the greatest Wolverine comics of all time. It’s his true origin starting from when he was a child. It’s absolutely epic. Great story, great art. 10/10. Grace, do you know if you guys are trying to get Darkhorse on board? I WANT STAR WARS COMICS!! PLEASE ask Marvel to get Thanos 1-12 up in digital form, and Annihilation Prologue. Also MARVEL: THE END. Can this great application be added to the “it only does everything” PS3? hard copy of comics should come with a code that allows you to download the comic for Playstation for free…..
Any chance for motion comics to hit? What about watching comics on the 1080p TV using the PS3? iPad = The Future of Comics. When will the Canadian store be getting this? What about Video? Still no news to report on deleting comics from the PSP through the comics program? Hope to see that soon, as I’m still going to have to steer clear of buying comics if I can’t filter out the unwanted free stuff.